If you came to this page directly, you might wish to read a page with an introduction to this section first. Descending the mountain by a very steep rocky road we reached the foot of it and entered Tiberias at half past four. It is a small wretched city of which the houses, or rather hovels, are built of stones, for the most part heaped on one another without mortar. In the walls about eighteen feet high are visible the patches with which the Turks have repaired the breaches made by the French when they took the city in 1799. William Turner - Journal of a Tour in the Levant - 1820. Turner made an excursion to Tiberias and its environs from Nazareth. We are camped in this place, now, just within the city walls of Tiberias. We went into the town before nightfall and looked at its people - we cared nothing about its houses. Its people are best examined at a distance. They are particularly uncomely Jews, Arabs, and negroes. Mark Twain - The Innocents Abroad - 1869. 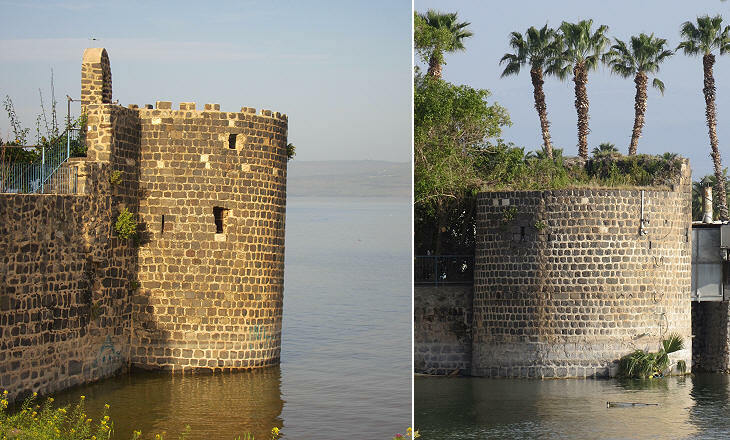 Twain reached Tiberias from Syria, after having visited Banias and Capernaum. 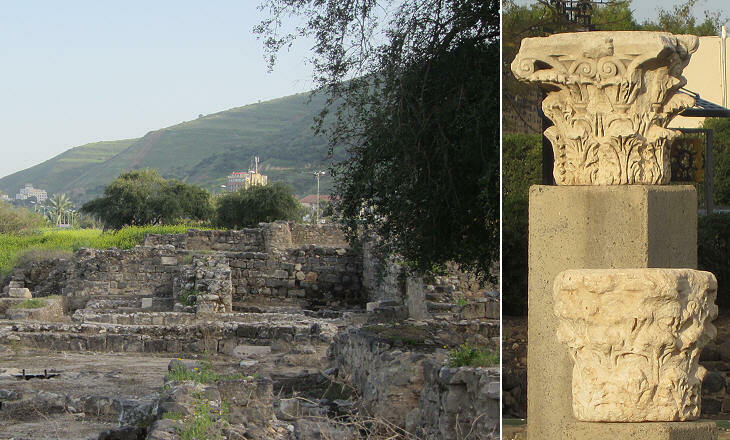 In the XIIth century Tiberias was the capital of a county of the Kingdom of Jerusalem. In 1187 Saladin, Sultan of Egypt and Syria, laid siege to Tiberias, in response to Crusader attacks to Muslim caravans en route to Damascus. The King of Jerusalem marched on Tiberias with a large army and the support of the Knights Templars and Hospitallers, two military orders. They arrived near Tiberias at the beginning of July when the heat was extreme (Tiberias is 200m/650 ft below sea level). Saladin prevented them from accessing water wells and in the battle which was fought at Hattin, a few miles northwest of Tiberias, he defeated the tired and thirsty Christian army. 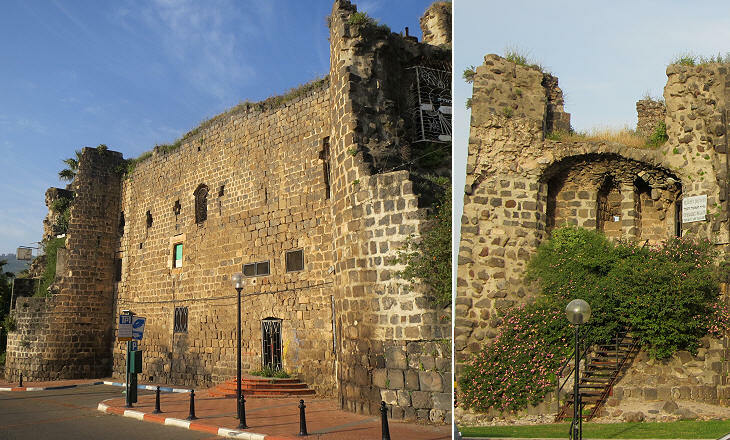 The king and the chief knights managed to reach Tiberias, but on the following day they surrendered. Eventually Saladin conquered the main towns of the Kingdom of Jerusalem including its capital. Turner was not much interested in the Crusader period, unless King Richard I the Lionheart was involved. Twain instead described the battle: We came at last to the battle-field of Hattin. It is a grand, irregular plateau, and looks as if it might have been created for a battle-field. Here the peerless Saladin met the Christian host some seven hundred years ago, and broke their power in Palestine for all time to come. Both armies prepared for war. Under the weak King of Jerusalem was the very flower of the Christian chivalry. He foolishly compelled them to undergo a long, exhausting march, in the scorching sun, and then, without water or other refreshment, ordered them to encamp in this open plain. The splendidly mounted masses of Moslem soldiers swept round the north end of Genessaret, burning and destroying as they came, and pitched their camp in front of the opposing lines. At dawn the terrific fight began. Surrounded on all sides by the Sultan's swarming battalions, the Christian Knights fought on without a hope for their lives. They fought with desperate valor, but to no purpose; the odds of heat and numbers, and consuming thirst, were too great against them. (..) Sunset found Saladin Lord of Palestine, the Christian chivalry strewn in heaps upon the field, and the King of Jerusalem and the Grand Master of the Templars captives in the Sultan's tent. Twain had in mind what Pliny the Elder wrote in Historia Naturalis - Book V: Iordanes (..) in lacum se fundit, quem plures Genesarem vocant, (..) amoenis circumsaeptum oppidis, ab oriente Iuliade et Hippo, a meridie Tarichea, quo nomine aliqui et lacum appellant, ab occidente Tiberiade, aquis calidis salubri. (The River Jordan empties into the lake which most call Genesarem which is surrounded by nice towns: Iuliade and Hippo to the east, Tarichea which gives its name to the lake to the south and Tiberias with its healthy hot springs to the west). 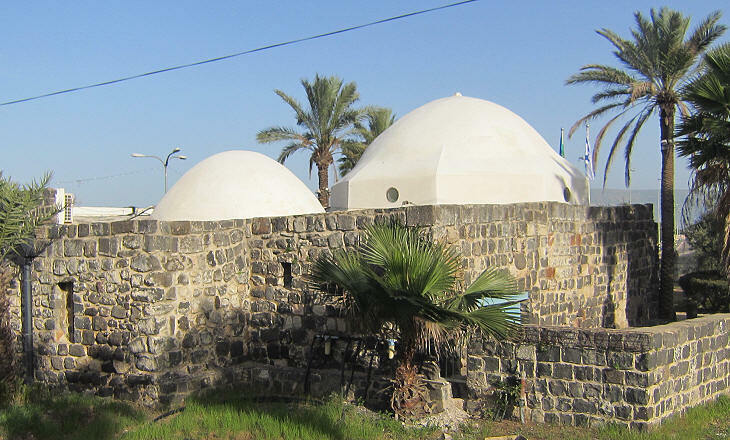 Today the springs are still utilized in modern facilities by the lake; the old hammam houses a small museum about the positive effects of hot baths. An ancient synagogue with interesting mosaics has been excavated very near the hammam. 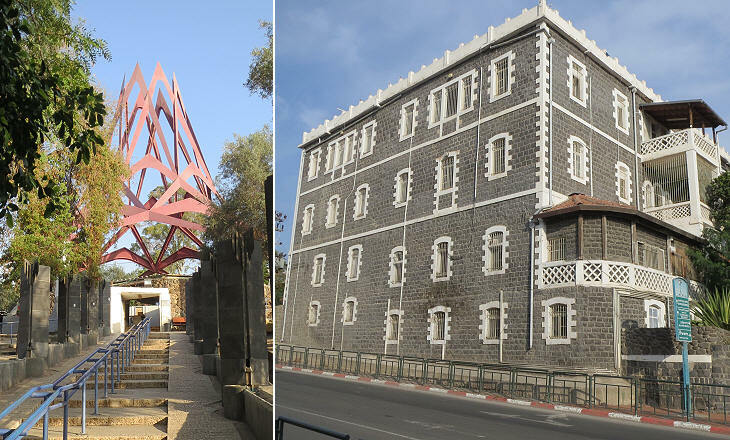 Initially the Jews refused to live at Tiberias because the town stood on a former cemetery, but in the IInd century it became a centre of Jewish religious studies and it continued to attract rabbis until it was conquered by the Crusaders. 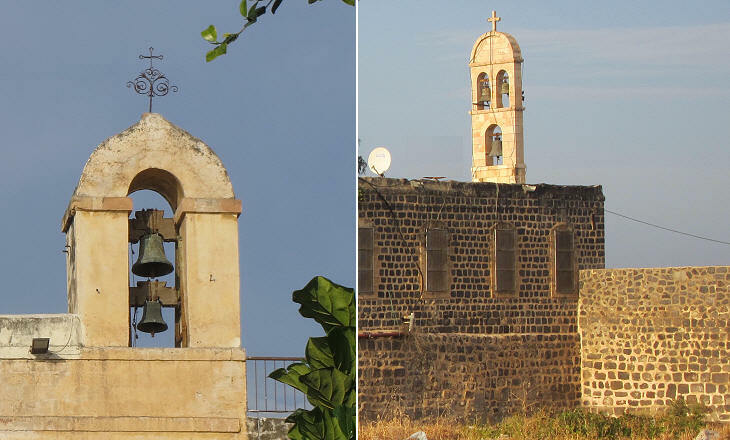 In 1247 Tiberias was seized and razed to the ground by Mameluke Sultan Baibars and for many of the following centuries it was just a small village. 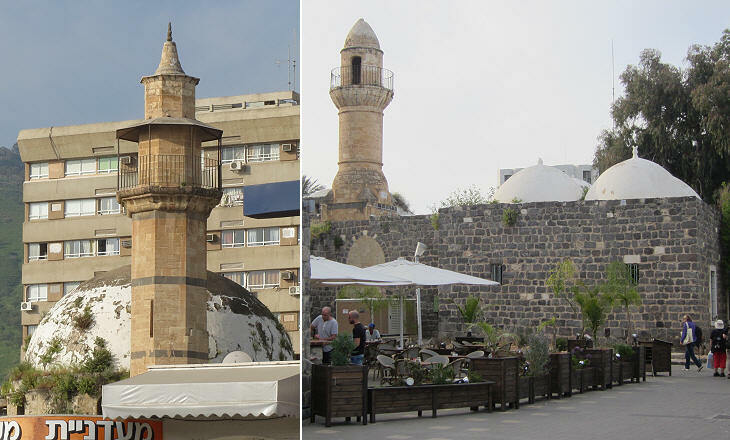 In the XVIIIth century Tiberias became the capital of a semi-autonomous territory ruled by Daher el-Omar, the son of a tax collector who expanded his father's activity to become a local chief. In 1743 the Ottoman governor of Damascus briefly sieged Tiberias, but altogether the authority of Daher el-Omar was tolerated as he paid the due portion of tax to the central government. He gradually expanded his authority over Nazareth and Acre and he founded Kaifah, today's Haifa.